The Sunset Playhouse is a story of friendship, camaraderie, joy, hard work, and perseverance. Since its first production of THE TURN OF THE SCREW, the Playhouse has been blessed with the contribution of 1,402,050 hours of dedicated service from 36,850 extraordinary volunteers. Sunset Playhouse is a not-for-profit community theater organization, incorporated in 1954. A building fund drive was launched, enlisting the support of the entire metropolitan Milwaukee area and, in March of 1960, the doors of the Playhouse were opened to the public. Sunset was the first theater in the state of Wisconsin to be built entirely by a community theater group and is governed by a Board of Directors elected by the membership. The theater staff consists of an Artistic Director, Education Director, Technical Director, Operations Manager, Box Office Manager, and several Box Office Associates. An active and diverse pool of volunteers work in conjunction with these paid professionals. 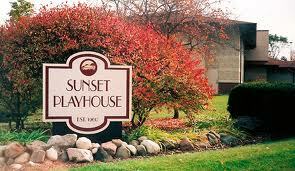 Sunset Playhouse produces eight main stage shows a year–comedies, mysteries, musicals, and dramas. Our Studio Theatre houses our After Sunset Series with four edgy dramas and musicals. In addition, the Playhouse is home to three professional series–Musical MainStage, with six concerts each season, a six-show cabaret series called SideNotes, and a three-show children’s series called bug in a rug. In addition, our School for the Arts offers a wide variety of classes and workshops for children ages 3 – 18.